For most of us the word ‘salad’ conjures up visions of lettuce, tomato and cucumber tossed with a slug of bottled salad dressing - not very appetizing and certainly not a real meal. Not so the easy, satisfying salads in this video class. They use grains and leafy greens with easy homemade dressings that are just delicious, and also cancer fighting and heart healthy too. Want to make salad a real meal and the real deal? Check this playlist out. This is a favorite from our in person cooking classes created by Chef Mark for our first Spanish program. We’d asked him to bring tasty cancer-fighting nutrition into the meals, and this salad was one of the ways he did it. 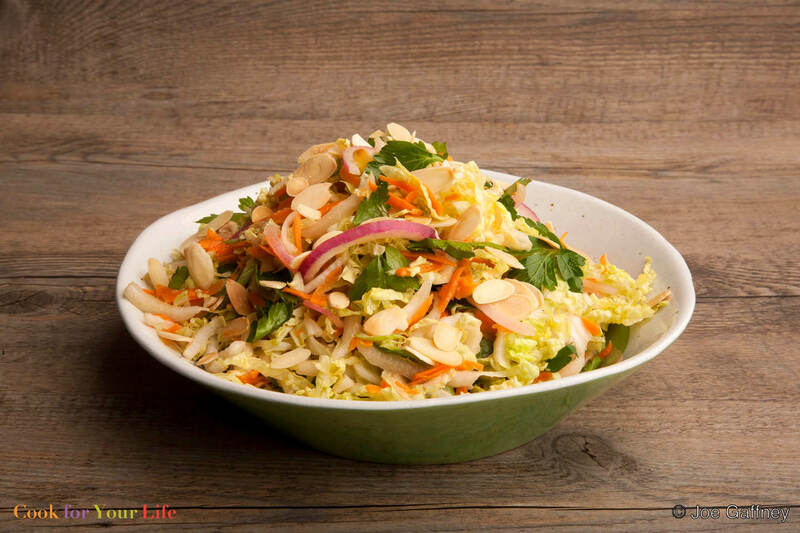 He substituted soft sweet Napa cabbage for the usual lettuce for a tasty satisfying side salad that can end up becoming a meal in itself. I love lentil salads. They take this humble legume beyond soup and into dishes that are protein packed, easy to make and deliciously satisfying to eat. This one is a kind of template that will give you ideas for different variations. It pairs a basic lentil salad with super-green watercress and everyone’s favorite, avocado. Yum! This is a yummy updated version of tabbouleh. Packed with nutrition, it uses protein rich quinoa instead of bulgur and therefore gluten free, and kale, the green that keeps on giving. Bound together by bite of a classic mustard vinaigrette softened by sweet, chopped dates, this salad takes a look at a basic that can inspire you to use quinoa and kale in all kinds of different ways. Try it.